From hero to zero, Nick Wilson had it all as a beloved superhero but when he lost his powers, the descent was catastrophic. Now, he's trying to make the best of a bad situation but he can't let go of the past and the past won't let go of him. 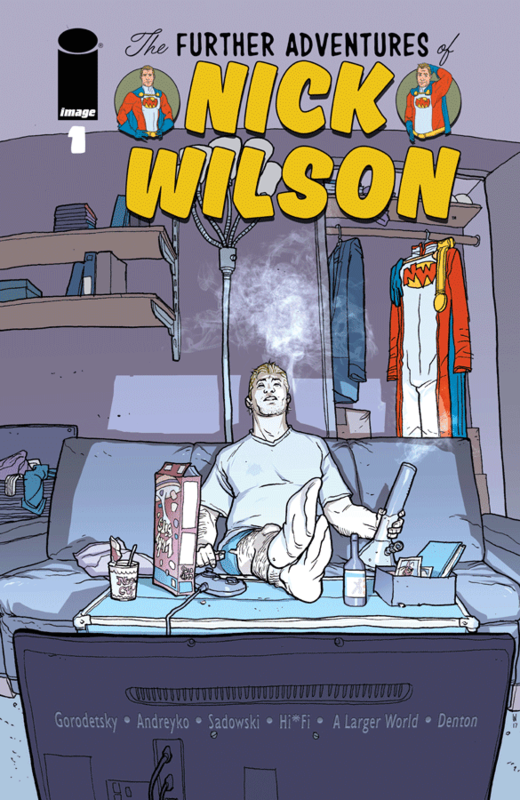 Nearing 30 years of age, Nick finds himself at a crossroads, humbled by his loss of powers and fame, he retreats to bong hits and playing a Nick Wilson impersonator to make some cash. Becoming tabloid fodder and being compared to his hometown's perennially hapless professional football team could make anyone a cynical has-been. Thankfully, even after an awkward lunch with his old high school sweetheart Nick isn't bitter or angry about his misfortune. He's not a resentful jerk which a story like this generally portrays and so far just seems like a guy left to the TMZ's of the world in the same way child stars burn out when they get older. Eddie Gorodetsky and Marc Andreyko add some nuance and vulnerability to the familiar deconstruction of a superhero story. The first issue sets up the groundwork for Nick's plight but it isn't dark and self-destructive. Instead, Nick is just trying to find his way post-celebrity, post-hero life. It's a bit sad that he has to play children's birthday parties, shuns the limelight, but welcomes fans if they approach him. The media still mocks him for flaming out and that stings even for the reader. For Nick, it's hard to look forward when you're not taken serious and your value as a human being seems to be in question. He tries to find some solace in an old flame but that too takes a downward turn. There are other forces afoot also from Nick's past but Gorodetsky and Andreyko leave it a mystery with enough of a hook to leave you wanting more. Steve Sadowski and Hi-Fi create a bright colorful story that belies the starker aspects of being a has-been superhero. A story like this could easily be a moody exploration about regret, depression, bitterness, and anger. The artists won't let that happen as they portray this world in the best light mirroring Nick's humble but affable personality. Sadowski's line work is impeccable and his character designs from Nick, the attractive single mother, his sleazy "business manager," and old high school sweetheart are pitch perfect. There's a strangely accurate portrayal of a bong rip (no judgement) but he's clearly done his...homework. What can I say about Hi-Fi as the color work is consistently on point. 'The Further Adventures of Nick Wilson' is an entertaining character study that's part-The Big Lebowski and part-E! True Hollywood Story. Gorodetsky and Andreyko have created a former hero worth rooting for in the hopes he'll find redemption. It's an intriguing enough debut to stir your curiousity with just the right amount of pathos and humor.